Milton Berlinski ’78 shares stories and wisdom from his nearly 30-year career in high finance. Photo by David J. Hawkins. When Milton Berlinski ’78 (Computer Science) first arrived on CSUN’s campus, the difference was palpable: A native of Aruba, he had gone from an island with a population of 60,000 people where he “knew pretty much everyone” to the San Fernando Valley — which, even in the ’70s, boasted a population nearly 12 times greater. He didn’t know a soul. 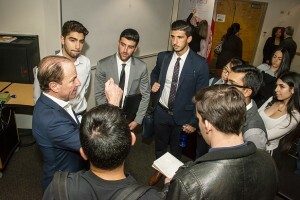 That was just one of the lessons the co-founder of Reverence Capital Partners LLC and the former head of strategy and corporate development for Goldman Sachs shared with an audience of students, faculty and staff April 4 at Bookstein Hall, home of the David Nazarian College of Business and Economics. The seminar was sponsored by the CSUN Student Finance Association. 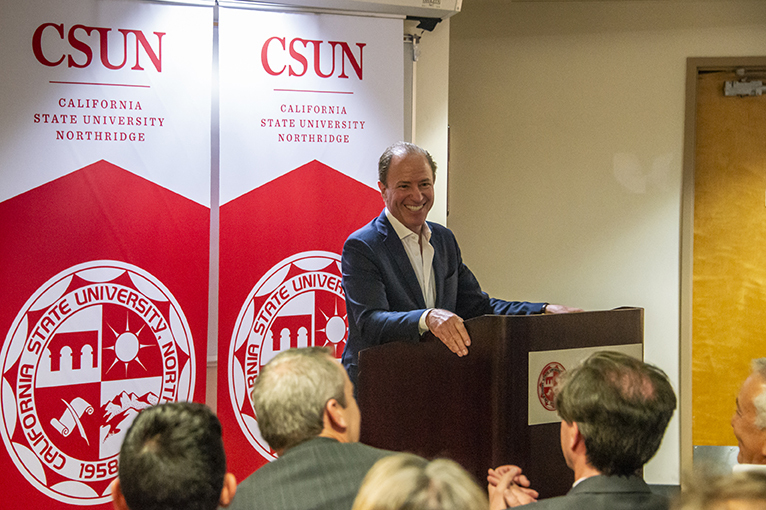 Berlinski spoke about his time at CSUN and his history climbing the corporate ladder in finance and investing. He stressed that the skill sets you have and can develop through education and hard work can put you on the right path to take advantage of opportunities. Berlinski answers questions from several of the CSUN students in attendance after his presentation. Photo by David J. Hawkins. His time as a CSUN student taught him many valuable lessons.